Irish Whiskey dates back to the 600s, when Celtic Christian monks began distilling it with a method brought over from the Middle East. It was so popular at its inception, it was referred to as Uisce Beatha, which translates to “the water of life.” Queen Elizabeth I was a huge fan, filling her court with it in the mid-1500s. Apparently, it was popular with royals the world over; in the 1700s, Czar Peter the Great of Russia fell in love with the ‘water of life.’ Irish whiskey topped the charts in popularity up to the 1800s, when it started to see a decline caused by political unrest. It almost faded by the 20th century, when only six Irish distilleries remained. But it’s a new millennium and with that, new opportunity. In the 21st century, Irish whiskey is having a comeback, growing at a rate of 20% per year, and probably bringing its owners a whole lot of green. Here are 10 cocktails that rely on Irish whiskey. Directions: Beginning with the coffee, pour all ingredients (not including the cream) into an 8-ounce stemmed glass and gently stir. Hand whip the cream so that it still pours, then using the back of the bar spoon to guide, float the cream on top of the coffee. Directions: Add all ingredients to shaker with ice. Shake hard and strain over fresh ice in a Collins glass. Garnish with a lemon twist. Directions In a tall ice-filled glass, add the Tullamore D.E.W. Top up with pressed apple juice. Garnish with a lemon wedge. Directions: Combine all ingredients in a cocktail shaker with ice and shake. Strain into a martini glass. Directions: Combine ingredients into a cocktail shaker with two ice cubes. Shake and double strain. Pour over crushed ice in a highball glass and float soda on top. Add grated nutmeg and serve. Directions: Combine all ingredients into a cocktail shaker with ice and shake. Pour over ice and garnish with a lemon peel. Directions: Place ingredients into a blender and blend until smooth. 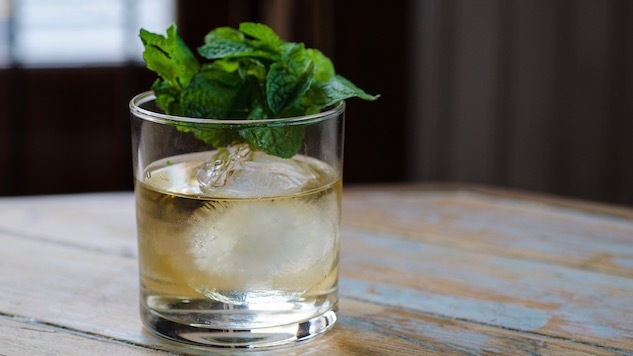 Pour into a pint glass and garnish with a mint sprig. Directions: Combine ingredients in a shaker, shake, then chill and serve in a shot glass. Directions: In a shaker, combine banana-infused whiskey and orange juice, shake until cold, then pour into an old-fashioned glass over a large ice cube. Garnish with a pinch of black sugar sprinkles. 1) Slice 2 ripe bananas and put into a clean glass jar with an airtight lid. 2) Pour 1/2 of a 750ml bottle of Jameson into the jar and close tightly. 3) Let sit on the counter in a dark spot and turn the jar gently once a day. After 4 to 5 days, strain the banana slices out using a fine mesh strainer and pour the whiskey through a coffee filter back into the jar. Refrigerate for up to 1 month.